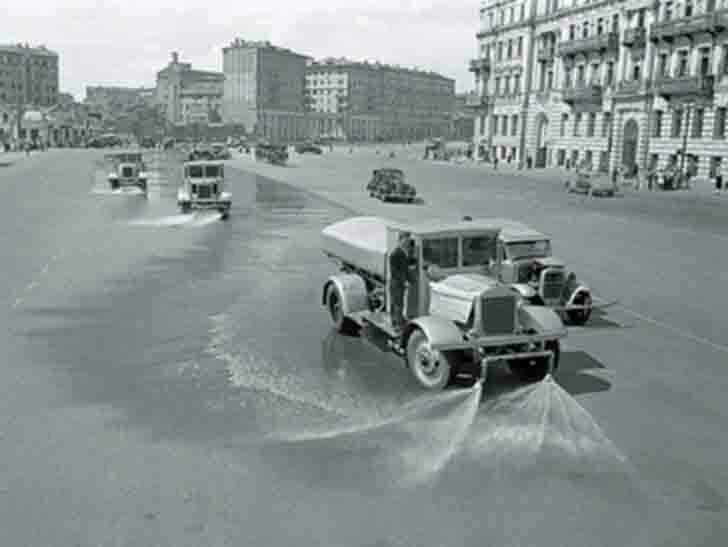 Watering machines demonstratively wash the streets of Moscow with soap and water, symbolically washing away the dirt with asphalt after passage of tens of thousands of German POWs in Moscow. View from the Zubov boulevard to Smolensk Boulevard. Right around the corner from the house – Prechistenka street. The march of German prisoners of war held in July 17, 1944 as a demonstration of his compatriots, allies in the anti-Hitler bloc and the worldwide defeat of the German forces in Belarus. In the Garden Ring in Moscow, and other streets have been about 57 000 German soldiers and officers (including 19 generals), mostly captured in Belarus by the 1st, 2nd and 3rd Belorussian Fronts during the Operation Bagration. Behind the columns followed by watering machines, imprinted in this picture.